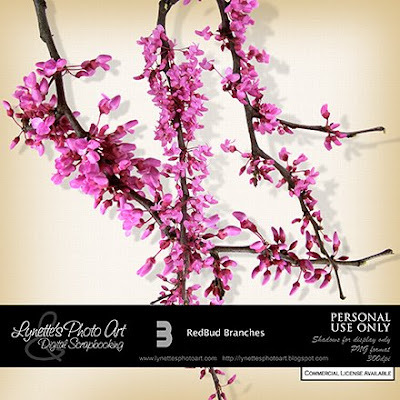 It's a mystery why they named these "Redbuds" since they are never red! But they are gorgeous here in the romantic Deep South. This is a close up of a tree to give you an idea how they look - and yes, they really are that brilliant of a fushia! 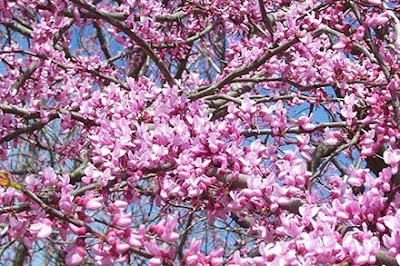 It's called a "Redbud", but it is not red. Let's take care that as we wear the holy name of Christ, "Christian", we do not live our lives in a manner that is not portraying His Holy Character to the world. Don't risk hearing "Depart from me, I knew you not" from our Master on the day of Judgment. Let's passionately seek the One who gave ALL for us and do our best to live in obedience to His Holy Word with all our hearts. Then trust His grace to be sufficient to make up the for our lack. Praise God for His Grace and Mercy! Hallelujah! Thank you Lynette, these blossoms are just beautiful. Thank you so much for this Freebie. I want to let you know that I posted a link to your blog in Creative Busy Hands Scrapbook Freebies Search List, under the Elements or Papers post on Jul. 08, 2009. Thanks again. I have a tree like this in my yard and it's wonderful. Thanks for taking the time to photoshop the branches. I see you are in good company! LOL June and Keryn are both acquaintances of mine and they are wonderful ladies! Redbud trees used to flourish here in Florida. I spent the better part of my youth sitting amidst the branches full of pink flora. Back in the 60's, though, a bad blight struck the species in this region. In a matter of a few years, every redbud tree around was dead or dying. Thank you SOOOO MUCH for sharing so much of your talent with us!